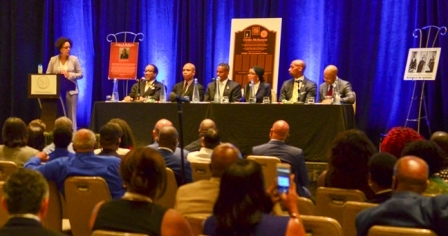 The New York Life insurance company recently hosted a panel discussion on bridging the racial wealth gap in Washington, D.C.
New York Life agents were in town for the company’s empowerment plan summit and to celebrate achieving their goal of reaching $50 billion in life insurance plans in the Black community. The panel featured Dr. Benjamin F. Chavis, Jr., the president and CEO of the National Newspaper Publishers Association; Reverend Delman Coates, the senior pastor of Mt. Ennon Baptist Church in Clinton, Md. ; Darryl De Sousa, the deputy commissioner of the Baltimore Police Department; Dr. Bahiyyah Muhammad, an assistant professor of sociology and anthropology at Howard University; Eugene Mitchell, the African American Market Manager for New York Life; and Jeff Pegues, the justice and homeland security correspondent for CBS News. Mitchell said that he wanted people to know that New York Life and its agents take economic empowerment in the Black community very seriously, because economic disparities breed lack of opportunities. “The understanding and conversations in the past have only been around burial policies and not tied to your value and worth,” said Mitchell. Coates said that now that New York Life has reached the $50 billion-dollar goal, the Black community desperately needs a macroeconomic strategy that will help to preserve the value of that investment. Chavis said that if we want to bridge the wealth gap, if we want to replace poverty with wealth, it first starts in the mind; it first starts in the consciousness. 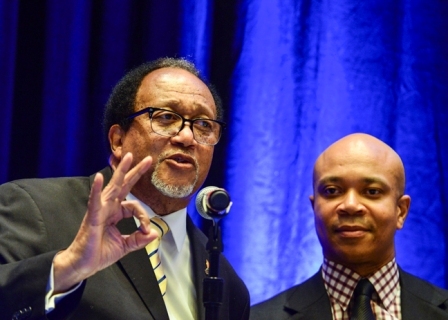 Chavis said that with the $50 billion dollar economic empowerment campaign, Eugene Mitchell and New York Life have shown that the Black families can instill wealth building into our mindset. Muhammad commended the life insurance agents in the audience for the work that they’re doing in the Black community and implored them to continue their outreach efforts. “It will be difficult, people will give you attitude, you will get individuals that will call you naysayers or disrespect you; it’s a lack of knowledge,” said Muhammad, adding that sometimes it takes providing the information in different ways.